When it comes to budgeting and spending money we all have our own unique plans. Some of us prefer to track every penny. Some people just go with the flow. Some prefer using cash-only, while others go card-only. I wanted to look at the pros and cons of a card-only spending plan. More protection. A credit card offers protection that you simply won’t receive from using cash. From extending your warranty to having to prove your purchase, a credit card can be much more reliable. Easier to track your spending. When you use cash you have to count all of your spare change and what not at the end of the month. With a credit card all you have to do is load up your statement at the end of the month to see exactly where and how you spent your money. This way there’s no uncertainty about your spending. You get to see where and when your money was spent. @Tuckeverlaster – call it what you will but i doubt they’d drop me as a customer. For me they’ll just keep uping my credit limit in hopes i one day use a bunch of it and finally have to pay them interest. I haven’t paid interest in over 10 years (not a single dime). @Taylor that’s true but then the credit cards co’s would hate you with a passion since you are in essence making them lose money. 2) Special introductory offers which you can capitalize on by BT’ing the amount and using it on something else that produces more interest and pocket the profit difference. 4) 25-30 day grace periods — You pay the balance back before the end of the grace and it is literally interest free money. I think buying things with our cellphones is already here. It just isn’t being adopted that quickly outside of Silicon Valley. Seems people are happy with just using plastic. Can you imagine when we become like Japan and we can do transactions with our phones? That’s a good point about cash being harder to keep track of each month. However, with a debit card the tracking is identical to credit cards. I dont think most people carry cash any more. Everything is done by plastic. Credit card companies love me. I always pay late and carry big balances. *Sigh* I blame my parents for getting me hooked. I tend to lose wads of cash. This is why i have been weened off using it and more with credit cards. 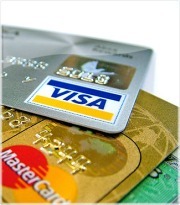 Benefits abound with credit cards. They even offer 0% interest if u know where to look (coughMBNAcough). I am still a heavy user of debit cards because i just am horrible at saving let alone paying back. So me with a credit card is a bad idea. Hmmm..not sure i agree with the entire analysis here. It really depends on how responsible the user is with credit cards. If one is dilligent about making payments each month (read: entire balance) then no matter what is said cc use is always the best route.